Most people infected with Ebola in the world's worst outbreak of the deadly virus contracted it from just a tiny fraction of patients known as "superspreaders", researchers have said. Six in 10 cases of the disease, which ravaged the West African nations of Guinea, Liberia and Sierra Leone between 2013 and 2016, were caused by just 3% of infected people, according to research carried out by several health experts. 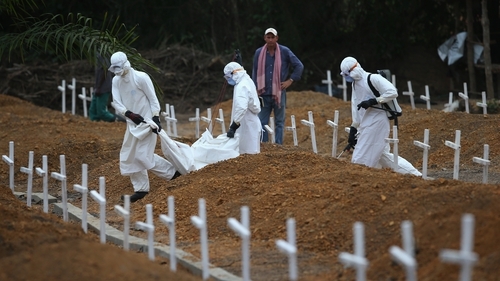 The slow international response to the epidemic outbreak was criticised in 2015 by medical charity Médecins Sans Frontières (MSF), which first raised the alarm over Ebola, for having created an avoidable tragedy that cost thousands of lives. "It was the infected people who didn't make it to health centres, and into isolation, that drove the epidemic," said Amanda McClelland, emergency health adviser at the International Federation of Red Cross and Red Crescent Societies (IFRC). "The lesson to be learned is that you need to find every single case if you are going to stop an outbreak," McClelland told the Thomson Reuters Foundation. Younger and older patients were more likely to have been looked after by many relatives and caregivers, thus fuelling the spread of the disease, several of the researchers said. "People between the ages of 15 and 45 were most likely to be carers and caring for someone with Ebola is a big risk factor in contracting the virus," said Sebastian Funk, assistant professor at The London School of Hygiene & Tropical Medicine (LSHTM).